It took me a while but I finally bought my first maxi dress! I didn't want one that looked like a long, shapeless sack and I literally tried on dress after dress and they all looked like that. 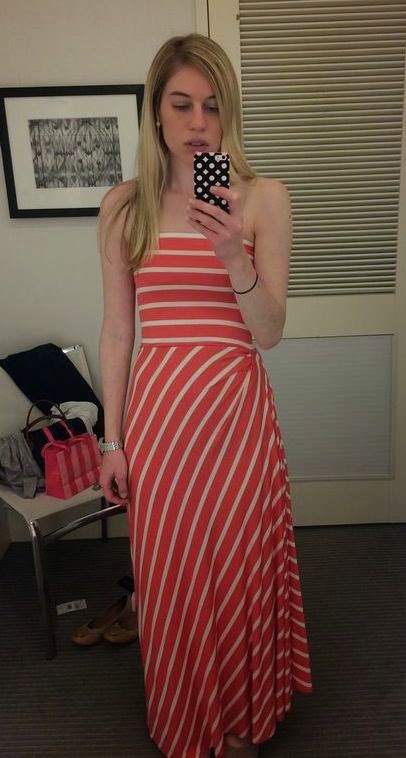 One day I was randomly in Bloomingdale's and found this striped, coral, strapless maxi dress that fit like a glove. Turns out, it was 50% off so I couldn't leave it there! I love that maxi dress on you!! Looks so good! Beautiful dress!!! I think it looks great! and I love the color! I totally know what you mean about long maxi dresses looking like sacks!!! Alycia//Crazily Normal I'd love for you to come check me out! I always love new blogging friends!